Chariot of a horse standing on its back feet, carrying Goddess Athena, holding her spear. Hand-Made Bronze Sculpture with Quality Guarantee. Traditionally made with the method of casting bronze and with a museum-like oxidization. Athena (/əˈθiːnə/; Attic Greek: Ἀθηνᾶ, Athēnā, or Ἀθηναία, Athēnaia; Epic: Ἀθηναίη, Athēnaiē; Doric: Ἀθάνα, Athānā) or Athene (/əˈθiːniː/; Ionic: Ἀθήνη, Athēnē), often given the epithet Pallas (/ˈpæləs/; Παλλὰς), is the goddess of wisdom, courage, inspiration, civilization, law and justice, mathematics, strength, war strategy, the arts, crafts, and skill in ancient Greek religion and mythology. Minerva is the Roman goddess identified with Athena. Athena is portrayed as a shrewd companion of heroes and is the patron goddess of heroic endeavor. She is the virgin patroness of Athens. The Athenians founded the Parthenon on the Acropolis of her namesake city, Athens (Athena Parthenos), in her honor. Veneration of Athena was so persistent that archaic myths about her were recast to adapt to cultural changes. In her role as a protector of the city (polis), many people throughout the Greek world worshiped Athena as Athena Polias (Ἀθηνᾶ Πολιάς "Athena of the city"). While the city of Athens and the goddess Athena bear the same name (Athena the goddess, Athenai the city), it is not known which of the two words is derived from the other. Athena is associated with Athens, a plural name, because it was the place where she presided over her sisterhood, the Athenai, in earliest times. Mycenae was the city where the Goddess was called Mykene, and Mycenae is named in the plural for the sisterhood of females who tended her there. At Thebes she was called Thebe, and the city again a plural, Thebae (or Thebes, where the ‘s’ is the plural formation). Similarly, at Athens she was called Athena, and the city Athenae (or Athens, again a plural). 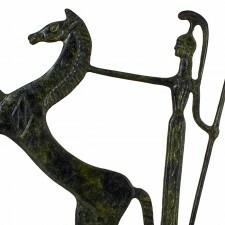 Athena had a special relationship with Athens, as is shown by the etymological connection of the names of the goddess and the city. According to mythical lore, she competed with Poseidon and she won by creating the olive tree; the Athenians would accept her gift and name the city after her. In history, the citizens of Athens built a statue of Athena as a temple to the goddess, which had piercing eyes, a helmet on her head, attired with an aegis or cuirass, and an extremely long spear. It also had a crystal shield with the head of the Gorgon on it. A large snake accompanied her and she held Nike, the goddess of victory, in her hand. In a Mycenean fresco, there is a composition of two women extending their hands towards a central figure who is covered by an enormous figure-eight shield and could also depict the war-goddess with her palladium, or her palladium in an aniconic representation. Therefore, Mylonas believes that Athena was a Mycenaean creation. On the other hand, Nilsson claims that she was the goddess of the palace who protected the king, and that the origin of Athena was the Minoan domestic snake-goddess. In the so-called Procession-fresco in Knossos which was reconstructed by the Mycenaeans, two rows of figures carrying vessels, seem to meet in front of a central figure, which is probably the Minoan palace goddess “Atano”. 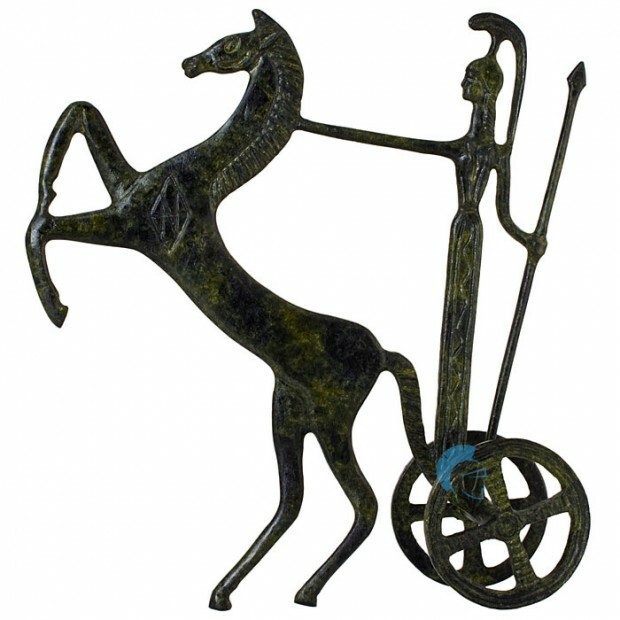 Traditionally made with the method of casting bronze and with a museum-like oxidization.